Amera is the name you can trust for handicap transportation in St. Petersburg, Florida. Our medical logistics coordination agency is experiencing phenomenal growth, and it is the product of hard work and a winning business model. We endeavor to go the extra mile on every level to exceed the expectations of each and every client that we serve. This is personally and professionally rewarding, and we have built a strong reputation because of our high customer satisfaction rate. This city is one of the centerpieces of Pinellas County, and it provides residents with a very high quality of life. There is a great deal of economic opportunity, but at the same time, the cost of living is quite manageable. The beaches in the area are world renowned, and local waterways are a haven for fishing enthusiasts and boaters that simply want to enjoy the sunshine and fresh air. Residents of St. Petersburg are fortunate in another way. There is a very strong health care community in town, and there are a number of different hospitals and countless medical practices of all kinds. We have a thorough understanding of the city and the intricacies of all major health care facilities. Our team members that provide transportation for disabled St. Petersburg residents are highly trained professionals that take the work that they do very seriously. We know that people need different levels of assistance, so we can custom craft wheelchair taxi solutions to suit the circumstances. When you engage our company, you can rest assured that you will get exactly where you have to go right on time. Plus, if you would like us to drop you off and wait for you outside of the health care facility, we would be more than glad to accommodate your wishes. 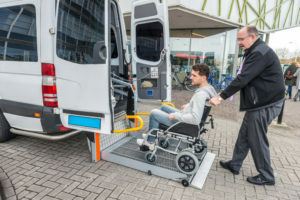 In addition to the top notch service that you will receive from our wheelchair taxi drivers, we place an emphasis on friendly, communicative customer service from the outset. When you call us for the first time, you are going to have questions, and our team members will be more than glad to answer them. Whenever you need a St. Petersburg, Florida wheelchair transport service, call Amera Solutions toll-free at 855-263-7215. You also have the option of sending us a message through the contact page on this website if you would prefer to get in touch electronically.